The Ghost X V 2.2 is a new iteration of the previous V 1.1 eVTOL. It features electric-powered rotors, a composite unibody fuselage, and a redundant design for safety. The cabin space area is advertised to be capable of various arrangements per client requirement and could be configured for cargo transportation and air ambulance. The interior also includes panoramic windows, 3 multitouch displays, and a Passenger Entertainment System with WiFi. Capacity: Up to 7 passengers, 1 pilot. The Ghost X V 2.2 is currently rising in to its share of the eVTOL and urban aviation industry. While the vehicle is not yet as popularized as many of the other competitors, its unique design and capabilities shall likely position it to be successful. The interior is re-configurable to suit the needs of a variety of customers, and is significantly more spacious than many competing vehicles. 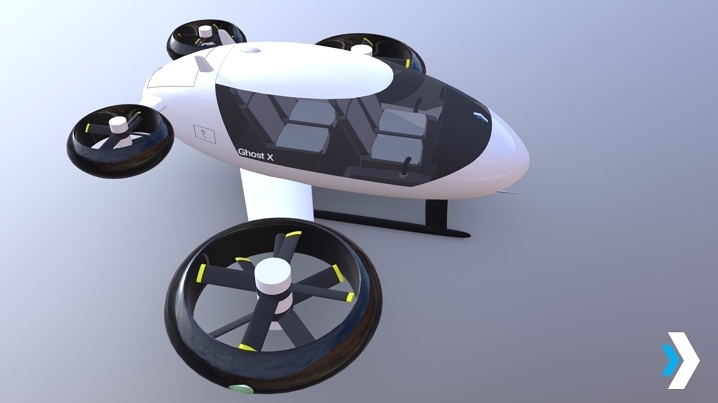 Therefore, the Ghost X V 2.2 has the ability to be marketed to a greater swath of potential buyers for its adaptability to passengers, cargo, or medical applications. A successful first flight in the near future would provide more insight as to the Ghost X's future and at what cost its performance compares to its competitors.